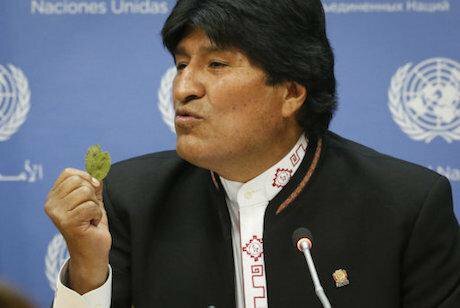 Bolivia president Evo Morales holds up a coca leaf at UNGASS press conference. B. Matthews/AP/PA Images. All rights reserved.So it’s all over. A United Nations summit that took three years to prepare for, cost tens of millions of dollars, and filled the General Assembly hall with political leaders and diplomats for three days, concluded last month. The official outcome, a consensus declaration running to 14 pages, despite some positive language in some areas, is largely a statement of ‘business as usual’ – no changes to the international drug control treaties, no revisions to the structure of the UN system for responding to drug markets and consumption, and no specific actions or deadlines to be implemented by member states or international agencies. Behind this disappointing headline, however, there is certainly some cause for optimism. There are many governments that accept the value and urgency of modernising drug policies and programmes, and of implementing new approaches. Several national leaders made it clear to the General Assembly that they are not happy with the inertia represented by the consensus declaration, and will not wait for permission from the UN to proceed with the implementation of the reforms that work best for their citizens (including the legalisation of cannabis). Meanwhile, others expressed equal determination to continue to, in the words of the Russian spokesperson, “intensify the war on drugs”. This polarisation of approaches means that the United Nations definitely has a real and persistent drug problem. This encompasses an ever-growing and diversifying illegal market that generates hundreds of billions of dollars per year in revenues for organised crime groups; the widespread use of this illicit revenue to corrupt institutions and political processes, and to fund other forms of crime and terrorism; increasing rates of addiction across all societies and cultures; hundreds of thousands of deaths due to drug overdoses, or drug market-related violence, every year; millions of people who use drugs without access to sterile injecting equipment contracting HIV or hepatitis infections every year; millions of people who use drugs arrested every year, and often subjected to harsh and disproportionate punishments, including a rising use of the death penalty. Any sense of shared responsibility between member states is now fundamentally broken. The global drug control regime was established to bring state control over, and eventually eradicate, illicit drug markets. But it is not going well. The last UN drug summit, in 1998, met under the slogan “A Drug Free World – We Can Do It”. Unsurprisingly, it turns out that, 18 years later, we can’t do it. The challenge facing the member states gathered in New York last month was to acknowledge that basic truth, acknowledge that repressive approaches had actually created many of the problems we now face, and agree a programme of action that could at least reduce the harmful impacts of a globally established commodity market with high demand, and multiple supply options. Their failure to do this demonstrates the other world drug problem – that any sense of shared responsibility or mission between member states is now fundamentally, and maybe irrevocably, broken. The United Nations drug control treaties were drafted and ratified in the 1960s, 1970s and 1980s in a spirit of shared faith in the ability of prohibition and law enforcement to strangle the illegal market, and thereby minimise the consequential harms to the health and welfare of citizens. Decades later, all governments know that this strategy has not worked – some (mainly from Latin America, but also including Canada) are reacting to that reality by calling for fundamental reforms, while others (authoritarian governments such as Russia, China, Indonesia, Pakistan and Egypt) are seeking further escalation. There is another group – and this includes most western European countries and the USA – which know that reforms are necessary, and are pursuing them in their own countries (often in sub-national jurisdictions), but are not willing to expend the diplomatic energy on attempts to reset the global agreements at this time. The era of tough punishment will increasingly be seen as a bizarre historical mistake. Cannabis regulation: In the last few years, one country (Uruguay) and five US states have implemented legislation to manage legal recreational cannabis markets. Canada has announced that it will implement the second national legal market in 2017, and several more US states seem likely to follow suit following votes planned for November this year. It is therefore reasonable to assume that by 2019 these defections from the global commitment to prohibition of all controlled drugs will no longer be possible to ignore. The United Nations’ drug treaty watchdog has already confirmed that regulated cannabis markets are a direct breach of drug treaty obligations, so either a process will need to be started to reform the treaties, or it will become clear that compliance with them is now optional. Reducing reliance on enforcement and punishment: The recent trend for countries to implement reforms that reduce the numbers arrested for drug possession, and reduce the punishments to those convicted, is likely to continue and intensify in the next few years. Governments around the world have viewed tough enforcement and sentencing policies as a sign of their commitment to the international regime, but that ‘spirit’ of drug control is now no longer in the ascendancy – most countries, and all UN spokespeople, at the UNGASS called for a move away from harsh punishments. While a few repressive countries declared their intention to continue arresting, incarcerating and executing those involved in the drug trade, it is likely that there will be further reforms around the world to decriminalise or de-penalise minor drug offences, or make punishments more proportionate (as endorsed by the UNGASS consensus document). As the evidence accumulates for the effectiveness of these measures, they will increasingly be seen as the mainstream, rational, approach to non-violent drug offenders – with the era of tough punishment increasingly seen as a bizarre historical mistake. Harm reduction: Speaking of bizarre mistakes, it proved once again impossible for the international community at UNGASS to even mention the term ‘harm reduction’ by consensus. Harm reduction is a policy approach that focuses on reducing the harms associated with drug use, rather than preventing drug use itself. It is already endorsed by every relevant UN agency, the World Health Assembly, the UN General Assembly and the UN human rights mechanisms, it has been irrevocably proven effective by numerous rigorous research reviews, and it is implemented in the majority of member states as an effective health promotion strategy. Harm reduction is one of the few clear successes in the drug policy field over the last three decades. It is therefore breathtaking that the consensus-based system for these UN drug debates allows a small number of countries to continue blocking its endorsement by the UN drug control organs. These countries do this not because they have any evidence of effective alternative strategies, but because harm reduction is rooted in support and tolerance for people who use drugs – and that challenges the ideology of zero tolerance and stigmatisation preferred by repressive regimes. Despite such resistance, more than 30 countries explicitly declared their support for harm reduction in their national statements at the UNGASS, and it is inevitable that the principles and practices of this approach will continue to expand in coming years. Unfortunately, and somewhat predictably, it is those governments that most vehemently oppose harm reduction that have the most urgent problems with overdoses and HIV transmission, and it is their intransigence that will ultimately undermine the achievement of the United Nation’s goal of ending the AIDS epidemic by 2030. While these policy debates move from the floor of the General Assembly to national parliaments and local administrations, it is ultimately the changing reality on the ground that will set the context for the next UN drug policy gathering in 2019. We have seen a significant shift in the nature and diversity of illicit drug markets over the last five years – no longer is consumption focused on a handful of substances, no longer can we draw clear distinctions between producer and consumer countries, no longer are the trafficking routes simple to identify and interdict, and no longer can the dream of stifling the entire market through big enforcement successes be seen as a credible strategy. A rapid diversification of psychoactive substances, production techniques, distribution methods, and patterns of consumption is inevitable, and governments now need to focus their efforts on how best to manage this reality in a way that minimises the social and health harms to their citizens. Any more time wasted on chasing the illusory objective of a drug-free country, region or world should increasingly be recognised as ideologically driven self-indulgence. This article is published as part of an editorial partnership between openDemocracy and CELS, an Argentine human rights organisation with a broad agenda that includes advocating for drug policies respectful of human rights. The partnership coincides with the United Nations General Assembly Special Session (UNGASS) on drugs.